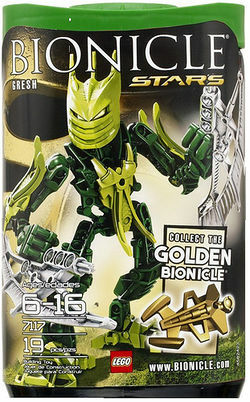 7117 Gresh is a BIONICLE Stars set that was released on November 14, 2009. 7117 Gresh includes 19 pieces to build the veteran Glatorian Gresh. He wields two silver blades, that can be put together to a shield. His mask is, in contrast to 8980 Gresh, fully lime green. Also included in the set is one golden piece of the golden armour for the left arm to assemble on 7116 Tahu. This set is designed to show Gresh after he found new armour. His shield and helmet are recoloured versions of the original versions. This is a description taken from LEGO.com. Please do not modify it. (see an archive of the product's page) Powerful Glatorian! Now a veteran Glatorian with the elemental power of air, Gresh is ready to make new allies and fight new foes to keep his people free. Gifted with elemental power by Mata Nui, he will use the skills he learned in the arena and in battle with Skrall to fight off the armies of Makuta. Includes one of six golden armor pieces. Gresh, a BIONICLE hero, is equipped with 2 blades! Collect all 6: 7116 Tahu, 7117 Gresh, 7135 Takanuva, 7136 Skrall, 7137 Piraka and 7138 Rahkshi! This page was last edited on 28 April 2016, at 18:18.